GALWAY IRISH CRYSTAL - Signed VASE - BEAUTIFUL PATTERN - EXCELLENT CONDITION . Shipped with care USPS Priority Mail. Galway Irish Crystal Vase - 10” - Certificates. Vintage Galway Irish Crystal Cut & Flared Vase - 10"
Marked Galway on base - Starburst bottom. few light scratches. New ListingVintage Irish Crystal Heritage Irish Vase Ireland 6"
Vase Ireland. LIKE new, perfect condition and was NEVER used, unopened wedding gift. This lovely vase lived forgotten in a box for decades. Colors may vary a little bit due to lighting but we do not enhance anything. 24% lead crystal. Tear at seam of box, see photos. A beautiful GALWAY 24% Lead CRYSTAL Bud VASE, ASHFORD pattern w/Cut Base used 1978-1993, from Galway, Ireland. Marked on base (etched) 'GALWAY'. Galway sticker is still present as well.d. CONDITION: While this vase is classified as used, the condition is superb. Tipperary Vase Irish Crystal Galway Ireland Waterford lead crystal hand cut about 4" tall. Shipped with USPS Priority Mail. No box. Original labels attached. This Is A Perfect 4" Tall Acid Signed Waterford Ireland Irish Crystal Deep Line Cut Facet Pattern Miniature Bud Vase. A lovely and tall Galway Irish Crystal vase with etched Claddagh design, in excellent used condition. Claddagh etching is sharp and intact. Crystal and finish are bright. Stunning Heritage Irish Crystal Vase. This is a 6" violet vase, and I believe the pattern to be Shannon. Gorgeous quality crystal, this item is in excellent condition with no damage of any kind. Please view all pictures and ask any questions prior to bidding or purchase. Payment highly requested within 48 Hours of auction end or item is subject to being relisted and reported. Thanks! S ee all photos. This is a gorgeous crystal vase in giftable condition. Includes original box. Marked on the bottom "Galway". It's very difficult to see, and to take a photo of but the mark is sandblasted. Sparkling Irish crystal! DUISKE Irish Handcut Crystal Floral Bud Vase 6"
Beautiful details on this small 6" bud vase. In very good condition with no chips or cracks. For sale is a lovely Galway Ireland 24% lead Crystal glass Bud vase with Ashford cut base. Other than the need of a good cleaning, the vase is in great used condition. The bottom of the base is etched, "Galway". Heavy, stunning crystal rose bowl, features a diamond design around the bowl, garland/vine around the rim, elongated rib design on lower section and bottom. Tyrone etched on bottom. Weighs 2lbs.14oz. 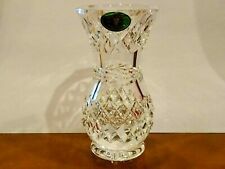 Galway Irish Crystal Vase - 10”. Brand New. Certificate of authenticity and care instructions. Number 1092 of 1500 made.